To watch this event, click here. 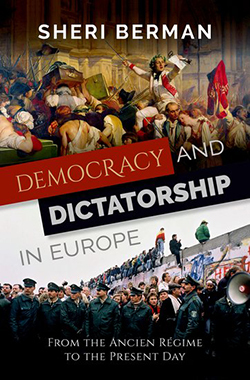 Democracy and Dictatorship in Europe (Oxford University Press, 2018)explains how democracy actually develops, and how we should interpret the current wave of illiberalism sweeping Europe and the rest of the world. Sheri Berman is Professor of Political Science at Barnard College, Columbia University. Ruth Ben-Ghiat is Professor of Italian and History at NYU. Jack Snyder is the Robert and Renée Belfer Professor of International Relations at Columbia. Alexander Stille is the San Paolo Professor of International Journalism at Columbia. Adam Tooze is the Kathryn and Shelby Cullom Davis Professor of History & Director of the European Institute at Columbia.